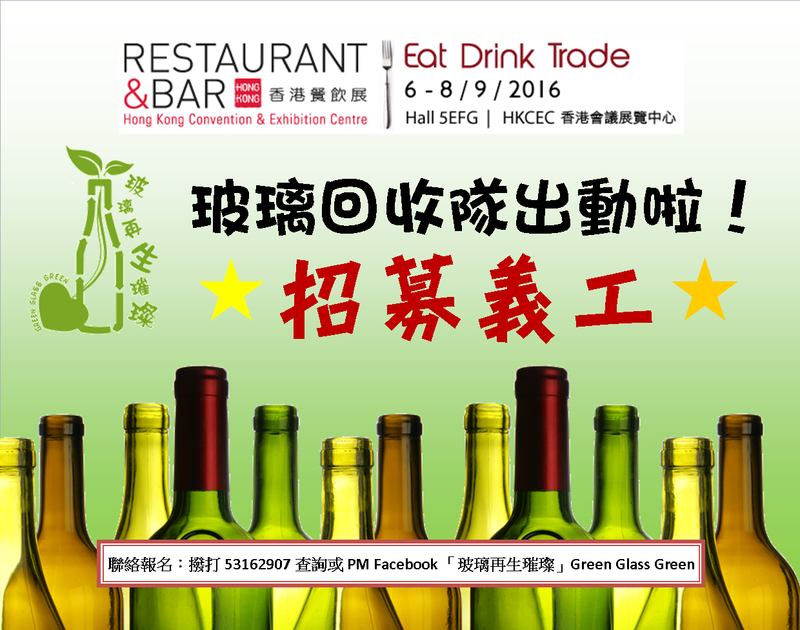 “Restaurant & Bar Hong Kong 2016” will be held on 6-8 September in Hong Kong Convention & Exhibition Center. It would be the fifth successive year for Green Glass Green to take part in. Our goal is to promote glass recycling among catering industry, which is one of the most crucial party for glass recycling. We would raise restaurants and bars operators’ consciousness of living green, i.e. to recycle glass bottle. It is a big event which requires a lot of helping hands! Please sign up via facebook PM, email: greenglass365@gmail.com or call 5316 2907. For enquiries, please PM us through Facebook or contact 53162907. Please tell us your 1. Available date, 2. Available period, 3. Interested responsibility, it would be better to work at least 3 hours per day consecutively. We are looking forward to seeing you right there!